Simple question - when establishing a webhook for time sheet item.create(s) with an external service (such as Zapier), Podio insists on a verification process, yet Zapier has no [apparent] method for sending a response verification. This is puzzling because Zapier explicitly supports Podio for integrating task items (they have a template for tasks that works seamlessly but no template for time sheets). Seemingly helpful, they do provide a webhooks component. I want to integrate a webhook for the creation of new time sheet items such that they are posted to a Google Docs spreadsheet, and Zapier seems to be the most ideal gateway for doing this. However, I find no evidence that Podio's webhook verification process will ever allow arbitrary use of the webhooks system in Zapier. Is there another way to achieve webhook verification? Hey guys, I'm a co-founder at Zapier. When these questions were originally asked, Podio was an app on our developer platform (https://zapier.com/developer). It didn't support webhooks, rather, it polled for changes to new items. We've since brought the app in-house to enable deeper podio integrations. We are still polling (for now) but can add webhook support to our development queue. The other bit that may be confusing is we have a dedicated "webhooks" app that can receive webhooks. Note that it ins't specifically designed to work with podio so it doesn't perform their intricate webhook verification dance. In short, still not possible out of the box with Zapier right now. You'd need a middle-man to perform the verification dance before the end result gets sent to Zapier. I am Christian, the engineering lead in Podio. Let me know what you need in terms of Webhook support, and I am sure we can accomodate you, so we can make the setup part easier. I've not found a way to verify webhooks for my desired use case. Hi Guys, thanks for following up on this. It's great to see Zapier finally supporting further integrations with Podio (items). Given how easy it is to create webhooks in Podio, a Zapier webhook integration seems like a match made in heaven. The services perfectly complement each other in design and principle and I think once customers of each app start releasing the potential of the other's applications, customer acquisition would go up for all. Once the webhook integration is taken care of, it would be great to see blog posts for both platforms and maybe even having "Zapier info" right on the Podio Developer page for apps. The more people aware of the possibilities the better! Thanks guys. We've even gone so far as to investigate using a middle-man script on http://webscripting.io but ran into trouble authenticating the validation request. Would love to be able to use the zapier webhook with podio, but as everyone says the verification gets in the way. right now we have to duplicate data manually between apps within podio and externally which is causing us to seek alternatives to podio. We will invest some time in the webhooks the next few weeks, and hopefully we should get solved. itDoesit offers a service similar to Zapier and already supports new items, changes and deletions in Podio. Excuse me! The name is spelled "itDuzzit". Ran into the same problem recently. Any developments on the verification process? 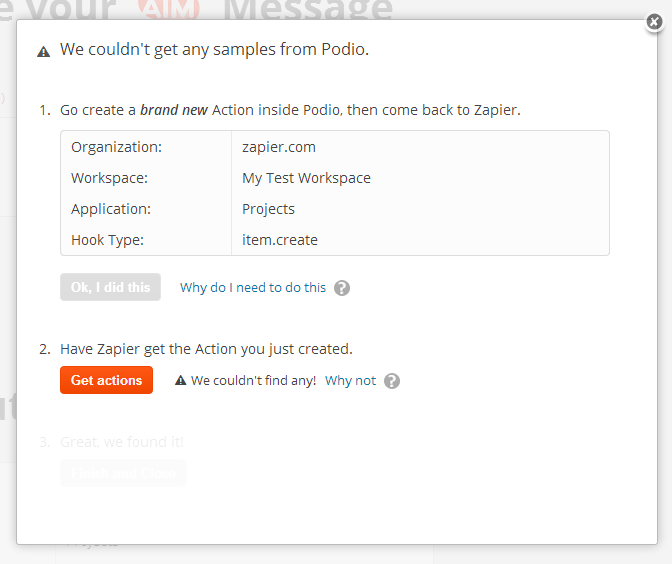 We added the ability to do this :) What you want to do is create a Zap on Zapier.com and choose Podio as the trigger service. Then, choose "New Action". From there you can choose the org, workspace, application and finally "Hook Type" you want to trigger off of. We'll do the work of setting up the webhook subscription for you. Let me know if that does what you want! Thanks for the quick turnaround! Can't seem to get it working though. I go through the steps and am unable to preview or retrieve sample data (does the webhook auth handshake not allow for preview data?) I've tried creating a new item in Podio then refreshing Zapier after, still no luck. Making the Zap live doesn't seem to help either.. Thanks Mike! I'll try recreating the zaps using these triggers instead. The changes will probably go live tonight sometime. Let me know if you hit any more problems! Thanks for the fix Mike! I recreated the zaps using NEW ACTION; works beautifully! Thank you! Is there a way to trigger a zap when the value of a widget changes? Podio has a very easy system for setting up information widgets and they can make perfect metrics for something like a Geckoboard dashboard. I think that should trigger off a change. Let me know if it helps! What I'm specifically referring to is data in a widget, not just an item updating. Podio offers widgets which can, for example, add up all the project totals from January 1st to March 31st, and display them as a number. That number is available via the API (https://developers.podio.com/doc/widgets) but is there a way for Zapier to see it? Ah okay. Our system isn't super well oriented to dealing with "updates" right now. Podio and tools like Geckoboard are a bit special. We'd have to poll for changes against the widget endpoint and we're just not set up to trigger off changes from polling. We are moving in the direction of being able to support those types of things, though. If there was a way for the widget to send "webhooks" to Zapier when things changed, you could rig up a solution. Alternatively, I suspect you might be able to coerce our developer platform to do what you want (https://zapier.com/developer) but it'd a pretty special and not (yet) well suited for everyone. I see the value in your suggestion - it would be ideal for Podio widgets to have an API that could be queried. I get the sense though that widgets are simply special renderings of roll-up data from filters. One way to get the same data into say a Geckoboard widget is to push the details up to Google Docs and then use Google scripts to aggregate the data and the push the regularly updated results to the Geckoboard widget. I've been doing this for a few clients for a while now and seems like a pretty good approach. For those that already had historical data I had to do an export and import manually to prime the tables, but once in place, Zaps that keep the data updated is all that's needed to have a place where you can manage a middle-tier that preps information for BI-like participation. I also created a custom Podio->Statusboard integration for iPad using this technique. I had a developer build a custom solution using PHP. Don't know all of the specifics under the hood, but the end result is that I add a custom Geckoboard widget, select "Polling", and enter in a custom URL that contains the ID of the corresponding Podio widget, along with the type of data (text, number, bullet graph, etc). When Geckoboard polls the url, a PHP script fetches the widget data and returns it in XML form. Cool. That's yet another way to integrate between the services. If anyone changes the format features of the Podio widget (which I notice our clients doing all the time), do you have to recode the PHP scraper? We do use lots of different widgets, but the widgets that supply numbers/text to Geckoboard always stay the way they've been created. I created them specifically to be used with Geckoboard and placed them at the bottom of the widget column. We almost never look at them inside Podio; only through Geckoboard. I just like the ease with which you can filter data in Podio. As long as I use a widget format that's been coded into the PHP script, I can keep creating new ones to add to the dashboard.